In the 1930’s-1950’s, Dallas was home to the world’s largest cancer clinic that was providing effective solutions to many types of cancer (some folks use the term heal), with 17 offices across the country and a growing reputation for their herbal tonic. A self-healing horse inspired the Hoxsey tonic and then the recipe was passed on to Harold Hoxsey as a teen in the 1920’s, and his father’s only deathbed stipulation had been to provide the tonic to anyone whether they could make payment or not. This Harold did until the very end. 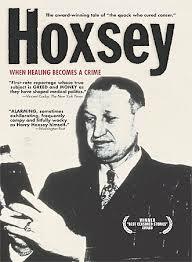 The good news was that Hoxsey was an oilman first, and the clinic was his duty, not a cash earner for him. He was referred to by his competition as a quack, and he was sued more than any other person for bringing people to a point of wellness and no not everyone every time. He would even pay for his patients travel, hotels, and their treatment. A man by the name of Al Templeton who was the Assistant District Attorney for Dallas had arrested him upwards of 100 times for “practicing medicine without a license” as by this time the AMA shut down any school of thought outside of their own allopathic care model as they have done since the very beginning. In 1939, Al’s brother-in-law was diagnosed with cancer and found it removed by visiting the Hoxsey clinic and using the Hoxsey tonic. Al then became Harold Hoxsey’s personal lawyer from that point forward. And several times Hoxsey was vindicated by federal judges and with favorable legal outcomes particularly one against the AMA. Dr. Fishbein the head quack hunter for the AMA went after Hoxsey time and again only to finally be stopped by his own termination twenty-five years later. Once Mr. Hoxsey won his federal case against the AMA Fishbein was immediately ousted from his position. “I am of the firm opinion and belief that Hoxsey has cured these people of cancer (with herbs). Hoxsey has been done a great injustice and articles and utterances by defendant Morris Fishbein (AMA Chief and Managing Editor) were false, slanderous, and libelous.” – Judge W.L. Thornton, Decision, Hoxsey vs. Fishbein. In the late 1950’s Hoxsey made an entire movie about the clinic and invited any MD or reporter to visit the clinic to talk to patients, review records, etc. Most did not, but a few did, and they all became adamant supporters of the tonic and clinic. 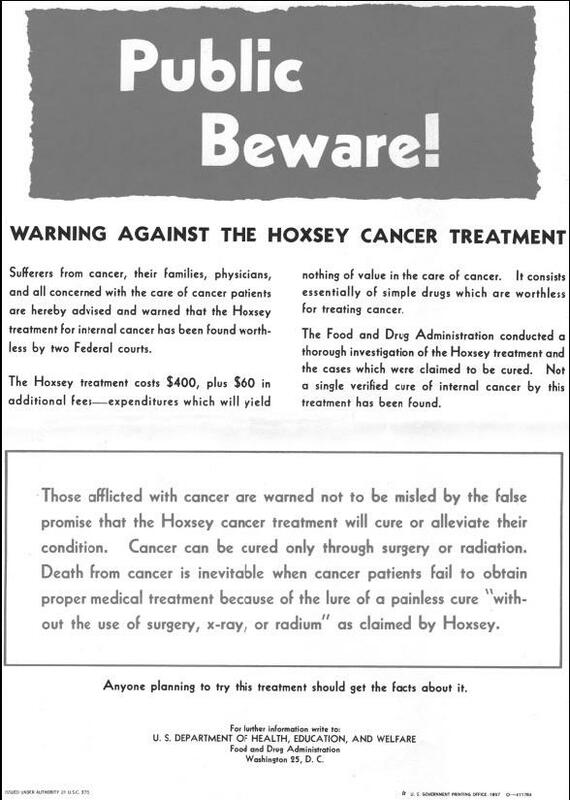 In 1955, the FDA went so far as to mail out to all 46,000 US post offices posters to be displayed saying “Warning against the Hoxsey (herbal) Cancer Treatment…Cancer can only be cured through surgery or radiation.” Profitable lies told to this day. See the sign below the story. After the AMA had lost its defamation lawsuit, the FDA magically stepped in to close down all 17 offices and then Hoxsey closed down US headquarters & clinic in Dallas. Before this, Hoxsey sent his head nurse to Mexico to open a clinic there. It is still in operation to this day. Hoxsey is just one of many cancer solution providers that the government has done all it can to silence. Investigate natural solutions and you will be amazed at how many ways to healthy there are and feel free to share this as you wish. Be Well! ← Roundup or Real Maple Syrup?